Firefighters face danger on a weekly basis. Even with protective gear and a team of trained firefighters by their side, there is no guarantee that a firefighter will be kept out of harms way. In the event of a blazing flame, firefighters must risk their well being in order to save potential victims and put out the fire before it spreads. Patrick Hardison was a volunteer firefighter from Mississippi. In an unfortunate mobile home fire in 2001, Hardison was searching for fire victims when the burning roof collapsed on top of him. His helmet was knocked off and his facemask melted rapidly. Hardison held his breath, closed his eyes, and jumped out of a window before the searing fire claimed his life. Unfortunately, Hardison suffered severe burns on his entire face, leaving him without eyelids, ears, lips, and most of his nose. The 41-year-old firefighter has undergone more than 70 reconstructive surgeries, but skin grafts taken from his legs only left his face with a build-up of scar tissue. The major deformities drew unwanted attention for Hardison, but the brave firefighter was not ready to give up. Dr. Eduardo Rodriguez, chair of the Hansjorg Wyss Department of Plastic Surgery at NYU Langone, was determined to help Hardison. Rodriguez took over Hardison’s case and immediately began coordinating with the Live ONNY organ recovery organization of New York to look for a donor. Any organ transplant is a complicated operation; in order for the transplant to take, doctors must find a donor not only with the right blood type, but also a similar height, weight, and age. A facial transplant is even more complex, as the skin color and bone structure also play very important roles in the chance of success. There is a 50% chance the transplant won’t take, as the patient’s immune system can easily recognize foreign skin and its antibodies as invaders. For Hardison, a brave firefighter who was determined to keep trying, anything was worth a shot. In July of 2015, David Rodebaugh, a bike messenger from Brooklyn, was left brain-dead after an accident in which he was thrown from his bike. 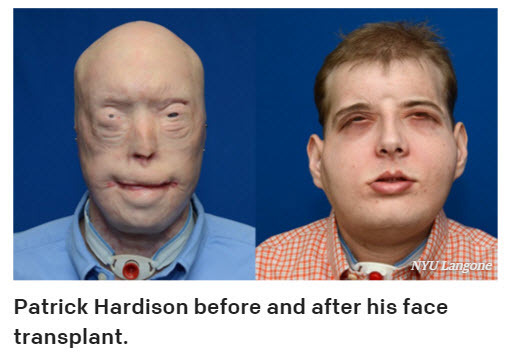 Rodebaugh turned out to be a perfect match for Hardison, and with consent from Rodbaugh’s family, Dr. Rodriguez was able to conduct the most complex face transplant in history. On August 14th, the face transplant took 26 hours and involved more than 100 people. As one team of doctors and nurses carefully removed Rodebaugh’s scalp, eyelids, ears, veins, and forehead tissue, another removed the accumulated scar tissue from Hardison’s face. The removal took 12 hours. By reconnecting the nerve tissue to that of Hardisons, surgeons were able to give Hardison the ability to blink once more. The transplant was a complete success. After the swelling went down, Hardison was able to carry on in his normal life. Although the surgery was quite risky, Hardison’s transplant was a stepping-stone in medical transplant history. With the help of immune-system suppressants, Hardison’s body has not rejected the donor and Patrick Hardison now has facial functions that he did not have for the past ten years. Mobile home fires are very real threats to a mobile home owner. In small spaces, fires spread even more rapidly, and the risk of burn and smoke inhalation increases as the fire grows. Although Hardison suffered severe facial burns, we are glad his face transplant surgery was a success. The risks mobile home fires present are very dangerous, and if it weren’t for the courageous efforts of local firefighters, these fires could easily get out of control. Need Mobile Home Roofing Repair? If your roof has leaks, it is advised you seek out professional repair as soon as possible. Not only do leaky roofs create hazardous mold, they present a serious fire hazard as well. Shorted wires in a leaky ceiling could start an unexpected blaze. If you believe your roof is in need of repair or even a complete overhaul, All Weather Roofing’s professional mobile home roofing repair contractors can schedule a video inspection of your roof at no cost to you. Don’t let the problem get worse. Get a free video inspection and determine whether or not your roof is need of professional repair today. See why All Weather Roofing is rated A+ with the Better Business Bureau by calling us 1-800-297-3758 or contacting us online today.